We were delighted to win the contract to extend Park House Nursing Home in Sandy, a neighbouring town to our office in Potton, Bedfordshire. Park House Nursing Home is based in a Grade 2 listed building, so any construction projects are strictly controlled and have to adhere to rules relating to style and materials used. At Hutchinson Builders, we are very experienced in working with listed buildings and their inherent complexities. This extension would allow Park House to accommodate 29 people and also upgrade some of the current facilities to make the home a more pleasant environment for its residents. 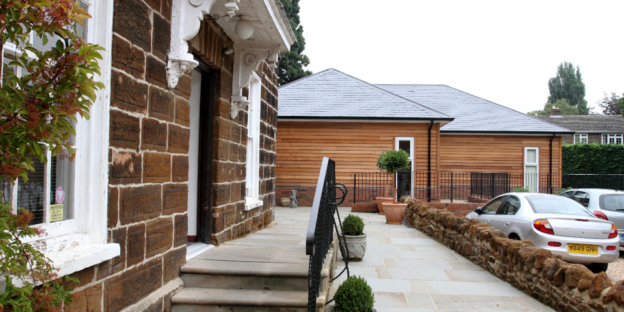 The project consisted of an extension which comprised of six bedrooms, four of which had en-suite wet rooms, as well as a relaxing day room for the residents. A complete re-wire to include cord pull alarm systems, as well as upgrading the existing heating system. For the duration of our project, the nursing home was fully operational, so it was essential that we worked sympathetically, in order to ensure minimal disruption for the residents and staff. Part of this was to ensure the current heating system remained functional throughout the upgrade, as the works were carried out over the winter and throughout spring. Externally we added attractive soffit lights which light up the building at night, creating a warm and inviting glow for visitors, residents and staff. The existing wall was in need of attention so we built a beautiful Sandstone wall and also laid a Yorkstone terrace, which is an attractive addition to the home. Park House Nursing Home provides residential care for people who want to live independently with minimal support and also for those who require care with nursing. It was a pleasure to work with them. "Hutchinson’s are without out doubt one of the best firms (of builders) I have ever dealt with. They are very thorough, their staff are excellent, and they are very focused on quality. The close involvement of Martin West and Robert Hutchinson made sure that no details were left unattended and Peter Dolling’s very close and hands-on management of the project gives great confidence that everything aspect of the job gets finished to a high standard. They have been a pleasure to work with and I would have absolutely no hesitation in recommending them." "The Gamlingay Eco Hub – A terrific use of space bringing the whole community together. Superb finish and attention to detail." "Thanks to Hutchinsons building the Eco Hub so well, the Eco Hub has just been entered for another national award, this time by SCAMBS District Council themselves. The LABC Award is for Building Excellence and is all about the essence of good buildings shown from a construction and technical building control point of view. As an architect, I am not surprised that Hutchinsons are starting to win national recognition for high quality construction. Here’s hoping we win this one too." "The wall at the entrance has been rebuilt and widened, the shop has a much needed new storage area and there is a much larger and welcoming Visitor Reception building to meet and greet visitors." "G&S Hutchinson provided a very helpful, flexible and friendly service under difficult circumstances with Huntingdon Bus Station remaining operational whilst the works were being carried out." "Achieving the seemingly impossible task of bringing the building back into use without damaging any of the historic features which make this building part of Harrogate’s heritage." This entry was posted in Testimonials on October 2, 2016 by Rob.